This friday, Armand de Brignac Champagne, popularly known as "Ace of Spades", will unveil its 30-Liter Rosé "Midas" bottle at the Hakkasan Las Vegas. 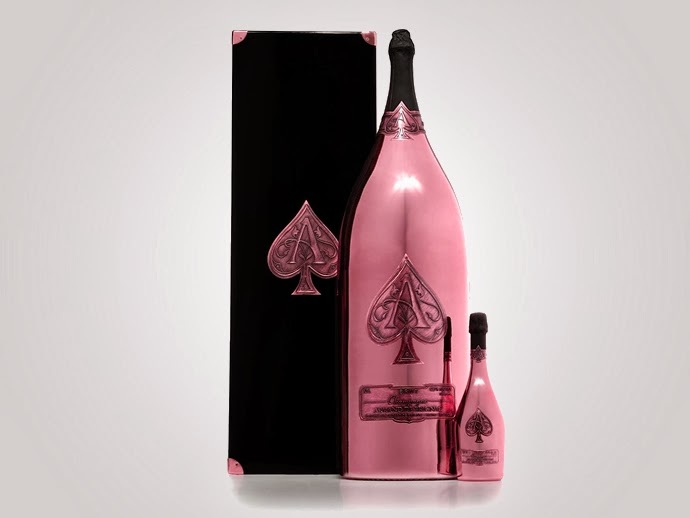 Equivalent to 40 regular-sized 750ml bottles, weighing 100 pounds (45kg) and measuring over 4 feet high, this colossal bottle is touted to be the world's largest bottle of Rosé Champagne. Yvonne Lardner, Global Director of Brand Communications for Armand de Brignac Champagne said: "From our insistence upon using grapes from the most historic villages of Champagne to our requirement that every step of the process be done by hand, everything about Armand de Brignac is done with an eye for quality and uniqueness. We are proud to be setting new benchmarks with our incredible large-format bottles and thrilled to be unveiling our one-of-a-kind Rosé Midas Champagne experience at Hakkasan Las Vegas." The Rosé Midas will be listed at Hakkasan Las Vegas for $275,000.